Yes, electrical outlets and switches on your walls can be an avenue for bugs and money out of your pocket. As far as your AC bill goes, one outlet is no big deal, but all the outlets combined can actually cause a draft in the home. 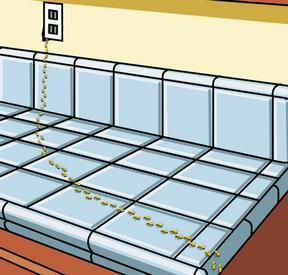 This air escaping not only increases your electric bill, but can give critters such as ants a nice scent trail for all the tasty treats in your home. Before you get started, turn the circuit breaker off. If you’re unsure if the power is on, plug something in to test or use a non-contact voltage tester. Next you want to remove the cover of the outlet. This is normally one-two screws, or will need to be pried off with a screwdriver. Once you have the cover off, take a look at the opening, if it’s less than 1/4 Inch you can fill it with acrylic latex caulk. If the gap happens to be bigger, you will want to seal with foam sealant that’s formulated for use around doors and window framing. Remember, the foam expands, so be mindful of this when applying. Wait for the foam to dry and cut off any excess so the cover fits. You can also purchase a pre-made foam gasket that goes over the cover to seal in the outlet. Secure the cover back in place. You can do the same for any opening on the outside of your home or simply hire us to do it all for you. "Thanks for a great job and for getting it done so quickly!"